We make them available in specific varieties. You can choose the one that suits your application. We also offer these in various grades of graphite with high density and minimum porosity. The economical grade of graphite that we offer is needed by gold jewelers & casters for its non reactive properties. 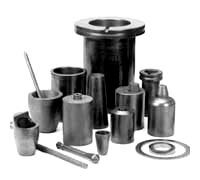 Besides, we are one of the most reliable fine graphite crucibles manufacturers and exporters from India.